Sunday afternoon marked the first of a number of freebies being provided by the Narrows with various partners this summer. Jam banders Old School Freight Train performed under the big tent at Bristol Community College on Elsbree Street in the Scholarship City. They've had a shuffle in personnel and are leaning toward the jam sound more than before. Check out the Narrows' schedule for more upcoming free concerts at www.ncfta.org. 19 years to life for producer Phil Spector--who produced John Lennon's "Imagine" and "Instant Karma," George Harrison's "My Sweet Lord," the Beatles' "Let It Be" album, the Righteous Brothers' "You've Lost that Lovin' Feeling"(he co-wrote that one too) and many more incredible records. More from Rolling Stone here. Musician and actress (she was in "Walk the Line") Amy LaVere ("Like Paul Revere,"she told me before the show) made her Narrows debut Friday night. She and her band have a quirky pop-rock sound that combines her innocent, nearly girlish vocals with maybe-banging-a-little-too-hard drumming and aggressive electric guitar. You should be able to hear the show soon by checking out the Narrows' archives at mvyradio.com. Former Rolling Stone Mick Taylor makes his Narrows debut in August. That's right, the guy who replaced Brian Jones and was replaced by Ronnie Wood. Of course, Mr. Taylor played on "Sticky Fingers" and other Stones' albums before departing. Visit www.ncfta.org and get your ya ya's out! Thursday night at the Narrows marked the 2nd visit for the celebrated group The Greencards, featuring two Aussies and a Brit showing us Yanks how roots is done. Soaring harmonies, snappy melodies and the strong vocal stylings of bassist Carol Young illustrated why these newcomers to our shores deserve, well, their green cards! Local Berklee student Andrea Belanger opened the evening with a set filled with strong vocals and a developing stage presence. Our partners mvyradio.com streamed the show live and will likely be posting the concert on their site in the near future. Narrows alum Jay Bennett died apparently on Sunday. Details here. Continuing from the previous blog entry about Liv Taylor at the Narrows on Sunday night--above Liv listens like a proud teacher as his student Liz Longley charms the crowd during his show. He brought her on stage for 3 of her songs and then, as the night's encore, a rendition of "Over the Rainbow." Ryan Montbleu, below got the evening started. He'll be returning to the Narrows soon for his own gig. Below, Dallas-based artist Richard Nunez paints a portrait of Liv Taylor during the concert, which was a benefit for mvyradio.com. Sunday night was benefit night for the archives of mvyradio.com, the Narrows broadcast partner. Funds raised help keep the archives available on the website of many past shows at the Narrows. Livingston Taylor was the headliner. That's him above relaxing in the Narrows office before the show. Below he's getting down with one of his students at Berklee (he teaches performance) Liz Longley. Liv Taylor is not only a great musician, singer and songwriter, he's a wonderful physical performer. He's always interesting to watch--whether he's telling a story or performing a tune. So, your humble blogger tomorrow will feature more shots from the show. Oh, and check out the mvyradio.com archives in a few days to hear the concert. Well worth a listen! Don't Miss Susan Cowsill in October!!!!!! 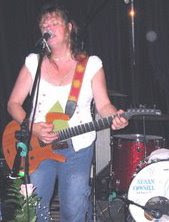 You humble blogger was delighted that Susan Cowsill has been added to the Narrows schedule. The photo is her at the Narrows in 2006. Yes, she's a member of the fabled, and tragic, Cowsill family. Yes, she was very little when she sang on their hit records. She's grown into an accomplished songwriter and singer. If you take time to listen to her music, you will absolutely enjoy it. This show has your humble blogger's personal guarantee. Something I haven't offered for a long time. This show is a lock. She's coming in late October, so there's plenty of time to get some dough together and get tickets. Even though you may not be familiar with her work as an adult, do not miss this show!!!! Dickey Betts and Great Southern brought their Dixie rock sound to the Narrows Friday night. They also brought to the stage a monster load of equipment, just like in the old days! Mr. Betts was in fine form, demonstrating that he truly was the core of the Allman Brothers Band. Youngsters out of Berklee in Boston, the Luke Mulholland Band, below, opened the show with their stoner rock meets southern vibe, led by 20-something guitarist/singer/songwriter Luke Mulholland, who hails from Canada. These guys burned up the stage, earning the honor of being your humble blogger's favorite new band. I should note that they chose to cover an often overlooked Beatles' rave up, "Hey Bulldog." An inspired choice! One of the first musicians to play a concert at the Narrows, Stephen Bruton, has died of cancer. He was a fabulous guitarist and worked with some of the greatest. Fab drummer Tom Major, above, and his group Entrain, brought their Bo Diddley-inspired rhythms to the Narrows Friday night. Jazzy brass collided with rock guitar, keyboards, bass and all sorts of rhythm instruments--all quarterbacked by the amazing Tom Major. It's not surprising that Tom pounds out that Bo Diddley sound: he was a mainstay when the recently passed rock pioneer toured. He also worked with Southside Johnny, Carly Simon, Blood, Sweat and Tears, and Chuck Berry. If you missed the show, it will soon be available at mvyradio.com. Narrows alum Jay Bennett, formerly of Wilco, is suing Wilco chief Jeff Tweedy. Keith Richards’ campaign manager (okay, it's Narrows prez Patrick Norton) and Steve Parrish, Jerry Garcia’s roadie and personal assistant for 30 years. He is now the manager for Moonalice, which played the Narrows Saturday night. It was a record release party at the Narrows for Sarah Borges and the Broken Singles Friday night. The CD, called "The Stars are Out," might be described as a bit less twangy and a notch or two more rocky than their two previous releases. And it includes a cover of Smokey Robinson's hit "Being with You," a rather unexpected choice; but then Sarah and her guys always surprise. It's fair to say that between Sarah's originals and their covers, this group has one of the strongest songbooks being carried by any band. While Sarah is lauded for her singing and fab performance skills, she deserves recognition as a serious songwriter. By the way, it was their 9th show at the Narrows, but the second one on our beloved stage for new guitarist Lyle Brewer, an emerging star. Keep an eye on this young guy, you guitar fans. He's staking out his own sound and integrating well with the band's wild yet disciplined approach. A skiffle group, Dog Bite, photo below, opened with a strong set. Can't seem to find much about this band. If anybody knows anything, please post. I very much enjoyed their set.